Buying a house is, arguably, the biggest purchase you will make in your life. Not only will you hunt high and low for just the right home, you’ll also need to get your finances in order before you dive in. But, when it comes to purchasing a home, the financial side of things isn’t a one-and-done step. Unless you plan on paying cash for the entirety of the home, you will need a mortgage. And, since that mortgage will affect your monthly bills for years to come, choosing the right mortgage financing is a major part of buying a home. If you have served in the U.S. military, odds are pretty good that you’re eligible to use a veterans home loans benefit. But, just because you’re eligible for that benefit doesn’t automatically make it the best home financing option for you. Explore how veterans home loans differ from traditional mortgages to help you determine which mortgage financing option is the best for you. VA loans have more relaxed credit score options. Your credit score tells a lender, in essence, how likely you are to pay back your loan. That’s why people with higher credit scores tend to get better interest rates. However, you don’t need to let a low credit score keep you from buying. This is one of the big benefits of a veterans home loan. A conventional loan generally has a minimum score requirement of 620. Veterans home loans, on the other hand, will approve applicants with scores as low as 500. You can get a VA loan with no down payment. VA home loans don’t require mortgage insurance. This is because the VA loan itself works as a sort of mortgage insurance. The Department of Veterans Affairs guarantees a portion of your mortgage financing, which allows you to get approval for a loan with a low credit score and a small down payment or none at all. And, since it’s part of your benefits, there is no additional cost for that guarantee the way there is with mortgage insurance. Veterans home loans are for primary residences only. Are you interested in buying a second home to keep as a vacation property? You may or may not be able to use your VA house loan to finance that purchase. There are a few caveats to allow for some flexibility. For example, there is a side benefit that allows someone who is active duty to keep a home they currently own (with a VA loan) and take out a second VA loan to buy a home when they PCS. However, that’s a one-time deal and comes with certain requirements. Otherwise, veterans home loans can only be used to buy primary residences, and if you already have a VA loan on one property, you can’t use another until that loan is paid off. There are no fees for veterans home loans. This is a big one: lenders are not allowed to charge fees when VA loan benefits are used. Of course, there is still the VA loan funding fee, which is a one-time charge, but lenders aren’t allowed to charge the borrower most other closing costs. In addition, that VA loan funding fee is often just incorporated into the loan itself so it can be paid out in monthly payments. Some of the VA loan benefits work in the favor of most buyers, but some of the other perks may or may not help you. For example, if you have a good credit score and a big enough down payment, a conventional mortgage could offer you better rates. Or, if you’re planning to buy a fixer-upper, a different loan program might be more beneficial. The bottom line is that it’s important to talk to multiple lenders or work with a mortgage broker to explore all the options available to you. 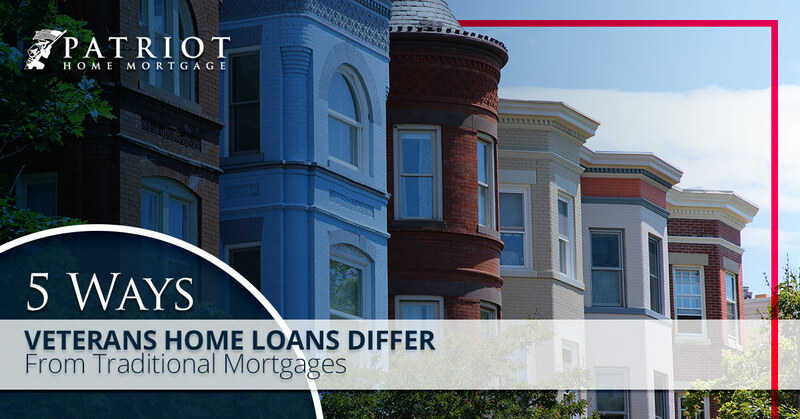 Patriot Home Mortgage is a VA lender and mortgage broker team. Give us a call to discuss your financial situation and learn more about the mortgage financing options available to you. We want to help you find the right financing, whether it’s veterans home loans or something else, so contact our team to get started!